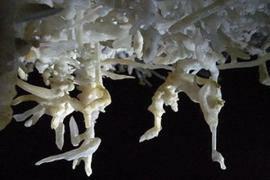 Molieres is found to the south of the River Dordogne, near to Beaumont du Perigord. 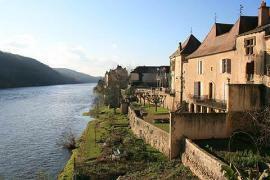 Molieres is a small bastide town of English origins built on behalf of Edward the first of England. 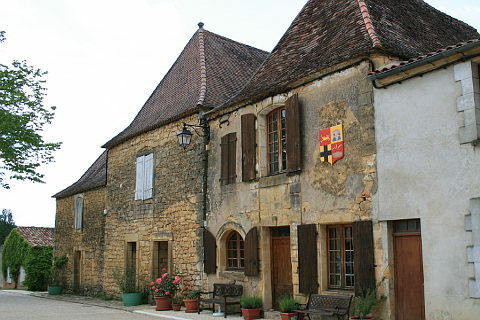 The bastide was built in the 13th century. 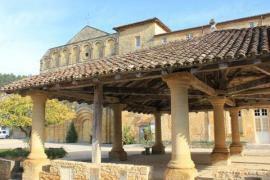 Like all bastides it is built on a regular grid pattern with a central square. Being one of the smaller bastide towns in the area it has escaped being swamped by tourists and remains a quiet village to explore. 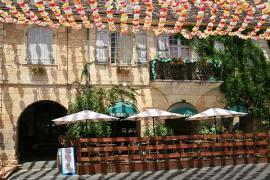 The village has been sympathetically renovated and as well as the main streets you will find smaller pedestrian alleys which have been recently repaved and parts are covered by climbing plants adding colour to the natural beauty of the golden stone. On the square there is only one arcaded building which remains- the Bayle house, unlike many of the bastides. Non-the-less the square is very attractive. The church is very large compared to the size of the village and has a lovely square bell-tower. Originally it had two towers but now only the one remains, this served originally as part of the town's defences. The church was laid to ruin in the wars of religion but rebuilt in the 19th century. On the edge of the town is the ruins of a 14th century castle built by Ghilem of Toulouse. This was built at the request of Ghilem of Toulouse as the town was largely unfortified. It was started in 1314 but never finished. Now you can see the remains of the defensive walls and in the middle of the enclosure the remains of a 6 meter-wide square tower. Take a walk around the outer streets of the bastide and you will find many interesting architectural details to admire, and some very pretty gardens too! 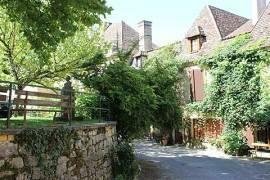 Nearby is the Manoir de Sautet which is a 17/18th century chartreuse which probably started life as a hunting lodge. 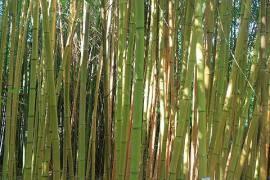 It can be visited on patrimoine days in September and on Mondays, Tuesdays and Wednesdays in July and August. It has an impressive potager to see. 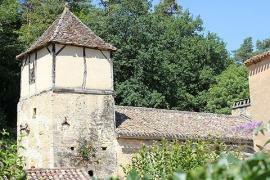 The Museum of the Walnut or "Maison de la Noix en Pays des Bastides" in Molieres has an exhibition of walnuts from its cultivation to its uses. It is open in July and August. 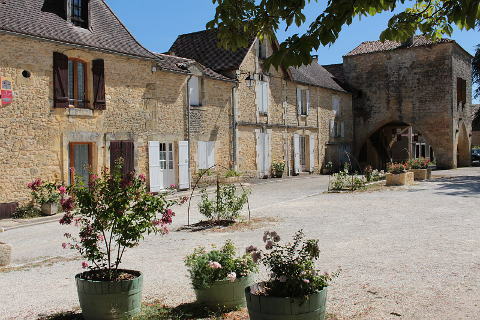 Molieres is close to the pretty village of Saint-Avit-Senieur, well known for its abbey. 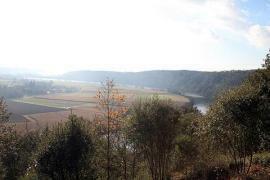 Also nearby is the attractive village of Tremolat near to which is an impressive viewpoint over the cingle de tremolat which is a large loop in the River Dordogne.